The clients who asked me to design this home had an unusual request. 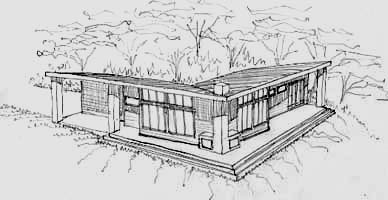 They loved the low income homes designed by the most famous American architect, and they were looking for something like that for their vacation home. Well it just so happens that I have studied many books about his homes, and toured several of them. And my favorites were also the designs of his low income homes. These were homes that were very efficient in design so poor people could afford to have a special home too. His first home of this type was also the first home to have radiant floor heating. 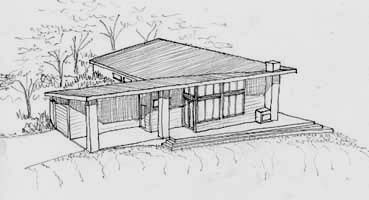 Another low income home was the first passive solar home. They were efficient and yet very artistic. Organic design was also important to him. The home must be designed to fit in with the property, the slope, the view, the trees, the breezes, and even the path of the sun. I believe that all homes should be designed this way too. I want to be sure you understand I do not copy the homes of anyone else, wether they are an architect or designer. But I continually study the work of others, and can apply some of their principles into my own designs. As recommended in one of his books, I am trying to stand on the shoulders of those who preceeded me. Before I started the design, I visited the property with the clients. We considered several locations for the home, and picked out the best one. It slopes to the south for passive solar heating. It has good access for a driveway, and the view is perfect. It looks down into a "holler." This is a mountain term for a small, quiet valley. They own both sides of the holler and the pond down below. I measured the slope of the site we picked. Then I designed a home that fit all of these requirements. Since it is a vacation home, the great room needed to be open to the view, and very informal. It also needed to open to a large outdoor area for entertaining when the weather is nice. To make the home more efficient and comfortable, I faced the glass towards the southeast and southwest, and covered it with just enough overhang to keep out most of the hot summer sun, but let in the warm winter sun. These two sketches show different views of the house. Notice the outdoor fireplace and grill on the corner. The patio is partially covered to provide plenty of outdoor space that faces the view. The simple roofline provides the efficient design they want. The angle of the patio comes to a dramatic point that draws attention to the corner of the house, the focal point. My clients were very calm and low key when we met. But they sure got excited when I sent them the design. I was also excited because I love this design and I hope to see it built. At this time we are waiting for them to arrange their finances for construction. Even though the house is not yet built, I wanted to include this design on my web site.